Marijuana is here to stay. You can try to hide, but it is not going away. For the last few decades, it was a toss-up as to whether the cannabis industry would survive on a legal level. Through legislation and voter passed referendums, marijuana has been legalized in various forms throughout the United States. As it is now a legal viable industry, cannabis promotional products should be something to think about to help promote your business. Promotional products for marijuana can take many forms. But, just like other industries, cannabis promotional products are a great way to gain impressions at a fraction of the cost of online or billboard advertising. With the industry growing at such a fast rate, you need to make your brand known or you could lose out to your competitors. As more companies pop up across the company, other companies are going to be choked out of business. Don’t make the mistake of not marketing yourself or you could be one of those who closes your doors due to massive competition. Legal cannabis spending is expected to hit $57 billion worldwide by the year 2027. Promotional products for marijuana is one way to help get a piece of that pie. If you don’t, your competitors will. Why Use Promotional Products for Your Marijuana Business? You are not the only one in the marijuana business. You are not the only one in the business of selling cannabis. That means you have competition. If you were the only one, then you wouldn’t even need a marketing budget. However, the market is now open for business and people are flocking to it in groves to make money. So while you may have only had a few competitors in the past, the market is now flooded with people trying to take business from you. So how are you going to keep your current customers and gain new ones? Well, promotional products have shown to help increase your sales. There is $47.3 billion on the table for the taking. Do you want to let your competitors get the largest chunk of that? I thought not. While you are thinking about legalized cannabis for recreational use, keep in mind that medical marijuana is still larger than the recreational side at the moment. And, both sides of the industry stand to make a ton of money. Marijuana is not only for recreational use. While 10 states allow recreational purchases and use of cannabis, another 33 states allow it for medical use. That means you can legally use marijuana in the majority of states in the U.S. If you are a business that prescribes or sells medical marijuana, promotional products are perfect to promote your business. Much in the same way pharmaceutical companies promote their businesses with promotional products at a doctor’s offices. Next time you walk into a doctor’s office, check out the pen you sign paperwork with. You will see the name of a pharmaceutical company that is pushing their brand and receiving thousands of brand impressions all for the cost of a single ink pen. This is proof of the return on investment you will get when promoting your medical marijuana business with branded cannabis accessories. Think about it like this. If promotional items did not work for pharmaceutical companies, why would they still give these products out to doctor’s offices? They are not in the business of losing money so obviously it is still a viable way to promote their products. As stated above, you are not the only one in the cannabis industry. So how do you get people to remember you over your competitors? 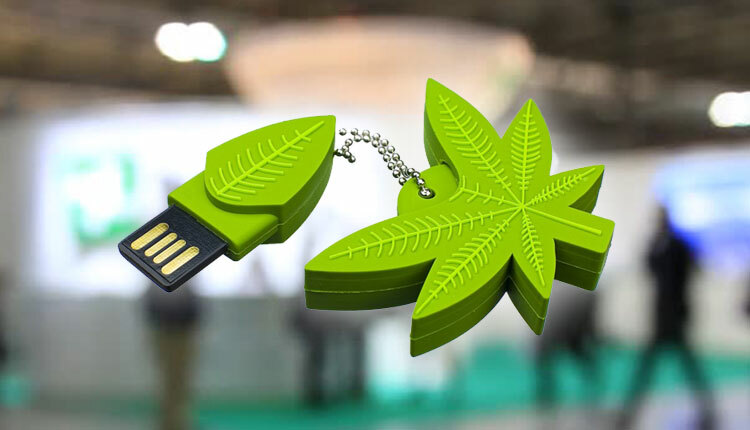 So what type of promotional products work best for the cannabis industry? Here are few items that will help you stand out from the crowd and imprint your brand on people’s minds. Pocket tools are great items for marijuana users. Cannabis requires the user to separate the product and often cut it into smaller pieces for ease of use. This is done with multipurpose tools that contain pliers, knives, scissors, and even tweezers. There are many different types of pocket tools that we offer. Each of them will remind the user of where they received their product and who they should call when they are ready for more. Custom corporate apparel items such as shirts and hats are great for spreading your brand name. If people like your product, they are more likely to wear corporate apparel with your brand name and logo on it. Many people who smoke marijuana do it with others. As such, other users will see your brand and potentially become customers as well. Pill holders and containers are another great cannabis promotional item. They are not just for pills. They can be used to hold marijuana for easy transport. Hand sanitizer is a must for anyone who uses marijuana. Let’s face it, cannabis smells as bad as cigarette smoke. Many people who use cannabis carry hand sanitizer to clean their hands and help reduce the smell. Wouldn’t it be great if they saw your name every time they did so? Customized bags – Don’t let someone walk out of your business without your name on a bag. You can also use customized totes which people are less likely to throw away. That way, your name stays with them long after the product is gone. They can easily look for your name when they are ready to make another purchase. Custom lighters are one of the best products for cannabis users. Even though I am mentioning them last, they should be one of your top considerations. Think about it…you cannot smoke marijuana without a lighter. We offer both custom Bic lighters and custom Zippo lighters that not only make great gifts, but are great counter items to sell at your store. In addition with giving away promotional products, you can also sell your own custom cannabis accessories in your store. Showcase your brand and products through a promotional product company store. So you can sell all of these products at your store and make additional income from branded products (which will also serve as advertisements for your business). People will essentially pay you to advertise for you. How’s that for return on an investment? Keep in mind that when you order in bulk, you also receive a cheaper price per piece on items you can resell. Placing a larger order will help you reduce cost and maximize your profit for each item you sell. Purchasing promotional products for employees is also a great way to advertise your business while they work in your store. Require them to wear an embroidered polo just like at the AT&T Store and people will start to recognize your brand based on color and logo. So, regardless if you plan on giving away promotional items, using branded bags as advertising tools, or having your employees promote your company through apparel, the possibility of promoting your business through cannabis promotional products are endless. Now that you know some of the best products to use to promote your business, let’s talk about the laws regarding advertising marijuana. Different states have different laws. For instance, California law requires that any advertising identify the person behind the advertisement. The recommendation is to at minimum have your license number on the advertisement. Individual states have laws that govern the advertising within their state. This is because marijuana is still against the law on the federal level. With laws being very strict on billboard and online advertising, the cannabis industry has largely turned to promotional items as a way for companies to brand themselves. So while laws are strict in some areas, they are lesser when it comes to promotional products. As with any regulated industry, I advise that you check with your jurisdiction for the specific advertising laws regarding promotional products for marijuana. The marijuana industry is exploding and there is no sign of it slowing down in the next 10 years. You can either sit idle or start to brand yourself in order to retain your current customer base and earn the business of new users in the market. One of the lowest cost and most rewarding ways to do this is through the use of promotional items. Make sure you are aware of the laws in the state in which you operate. You will want to brand yourself without running afoul of any laws or regulations. If you are unsure of the best products to use for your business, contact a promotions specialist from iPromo who can walk you through different options. Don’t forget about our best price guarantee so you will be sure to get the best branded cannabis accessories for the lowest price available.